The exhibition focuses on art practice of Krzysztof Wodiczko, the pioneer in art productions in public space, one of the most important personalities in critical art. Wodiczko, by continuing the avant-garde tradition, has worked out the technologies of disagreement and transformation of the reality and highlights critical and utopian dimension of art, which he understands as practicing democracy. The exhibition On Behalf of the Public Domain reflects the diversity of his artistic productions stressing the importance of his early works, which marked the beginning of the passage from artistic to political issues and from the private sphere to public space. This retrospective, although not fully chronological,  provides an overview of Krzysztof Wodiczko’s artworks and develops the main themes of his productions over the period 1969–2014. Works from the 1970s are reminded as the key to his further practice, in which ethical imperative links aesthetics with politics. The period is marked with interdisciplinary experiments and the combination of the tradition of constructivism with the experience of a designer and a neo-avant-garde  artist placing himself against the context of the developments of those times. These interests are illustrated with recordings of live performances, a series of ironic, self-portrait productions, objects, drawings and documentation of the first interventions in public space. Huge spatial installation of 1972 is being especially reconstructed for the exhibition to introduce the visitors to a long corridor of the eponymous Passages. Another crucial work of this period is called References, in which images of various historic epochs are projected against canvases covered with lines painted on them. Its analytical view upon ideological dimension of what it represents was further developed  at the beginning of the 1980s in monumental projects in the public space. 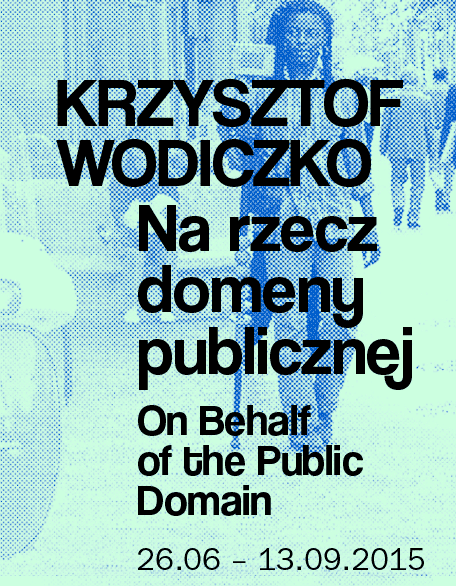 The works of Krzysztof Wodiczko „on behalf of the public domain" and his efforts to make the common space available to all users are evidenced by a vast body of documentation covering the selection from among ca. 90 projections, which took place in various countries and continents. Starting with the first productions dating back to the beginning of the 1980s, which analysed the political sense of architecture as a representation of power, through a series of productions, in which he critically read the history written down in buildings or delivered in response to political developments; Wodiczko’s projections reject the official narrative of monumental history and go against  monopolising the collective memory. Film footages presented at the exhibition are meant to remind monumental projections presented since the mid-1990s using the video technique, where  Wodiczko enlivened buildings and monuments with images and voices of homeless people, immigrants, victims of violence and abuse, war veterans. Xenology: Immigrant Instruments and Vehicles shown and tested in Europe and the United States since 1989 demonstrate how  the philosophy of dialogue developed. Wodiczko, a designer by education, was working out more and more technologically advanced devices giving visibility and voice in the public space to those who are Different. The exhibition will also show, inter alia, Veteran’s helmet the latest communication tool designed by the artist. Recent works reflect Wodiczko’s involvement in anti-war debates. His idea of the “disarmament of the memory” is translated into projects, which de-construct the memories of war and violence and have their origins in earlier artistic practice of the artist. The idea of the World Institute for the Abolition of War engaged in activities consisting in cultural disarmament of myths created around wars and housed in  the Arc de Triomphe in Paris covered with an architectural structure is a spectacular example of his attitude. At the exhibition the project is illustrated with large scale visualisations and offers an aesthetic and political response of the artist to the need of working out public discourses of anti-war culture. Exhibition open until 13 September 2015.